Cyfe is a cloud-based online business dashboard that has grown to be used by more than 170,000 customers since its creation in 2012. A privately-held company based in Santa Monica, California, Cyfe has been featured by PCWorld, TechCrunch, Mashable, Inc. Magazine, Fox News and Forbes. Users praise the product for its ease of use & implementation, the utility of its real-time business analytics software and its responsive customer service. The Cyfe online dashboard is aimed at enterprises of all sizes. Its intuitive user interface puts desired data all in one place with fully customizable dashboards. Cyfe has the ability to incorporate data from over 500 third-party services, including commonly used Google services, Twitter, Facebook, and more — not to mention custom data from proprietary servers, databases, and other sources. Cyfe users can share dashboard data with managers, clients, employees, or other collaborators. Data reports can also be automatically emailed or downloaded in PNG, JPEG, PDF, and CSV formats. From social media to marketing to sales, Cyfe is designed to help users monitor and analyze data scattered across multiple online channels. Cyfe’s basic offering is free, which restricts the amount of features (max. of 5 widgets on 1 dashboard) & historical data (rolling 30 days). An optional upgrade to a Cyfe Premium subscription, which costs $19/month for an enterprise license, offers an unlimited number of dashboards, widgets, and users, along with more features such as unlimited historical data, data exports, full customization, TV Mode, and sharing capabilities. Some notable Cyfe clients include corporations such as ABC, AT&T, Whole Foods Market, Marriott, Vodafone, and Groupon. We recommend Cyfe to businesses of any size, but especially organizations lacking IT resources but wanting an intuitive dashboard solution that makes it easy to aggregate data from disparate sources. Have questions about Cyfe? 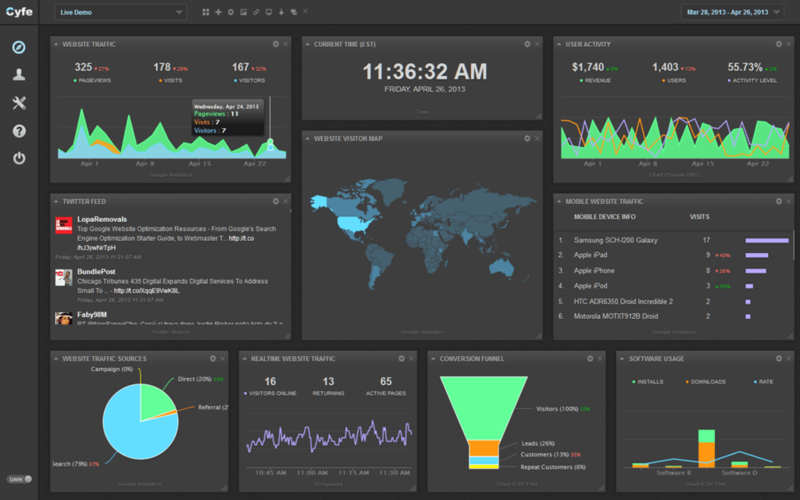 Want to learn more about dashboard software? Call, click, or email to speak with an unbiased Technology Advisor for a no-cost, no-obligation consultation on your unique requirements. Learn everything you need to know about Cyfe. Our experts will reach out to you shortly.